Just a quick mid week post to show you what I have been up to. I swapped my crochet hook for knitting needles just for a change to make this fun hat. Hats are great for keeping you warm on these lovely spring days, you know when you don’t need a coat but a thick sweater with a hat and scarf are just the trick. I am so sorry but I made it for my daughter’s nephew, I just made it up as I went along so I don’t even have a pattern I can share with you. If you are not in a hurry for one I could add it to my things to make list but in all honesty it would be a couple of months before I could do it. I am so pleased that you like it so much though, thank you. So cute! Great job, Geraldine, you are a woman of many talents! Thank you, I have heard that the little man who received him loves him. Thank you, he was great fun to make too, it took a couple of goes to get his snout right though. I am new to knitting so I don’t think I could just make up a pattern. You really should write a pattern for this and offer it for sale. I would be the first in line to buy one. I have three grandboys who would love that hat. What talent. Wow, thank you for that, I will put it on my to do list, but to be honest life is rather hectic at the moment so I am not sure when I will get round to it. Oh, I see a whole line of these–many different animals and fantasy creatures! Very fun and so creative! Unicorn next? A unicorn is a great idea, I have made more hats, posts to follow just waiting for some good images. Errrrrr, no, not for me, I might like one if it were purple though. this is awesome! do you have a pattern? So sorry but I made it up so don’t have a pattern. I love the dinosaur fun hat! Oh he’s lovely! (Can a dinosaur be lovely? lol). Is this your own pattern? Yes it was made on the back of a batch of hats made for presents and I had a request for a dinosaur and did’t have a pattern so just made it up. That is lovely. Where did you find the pattern please. Thanks, I am so sorry but I didn’t use a pattern. 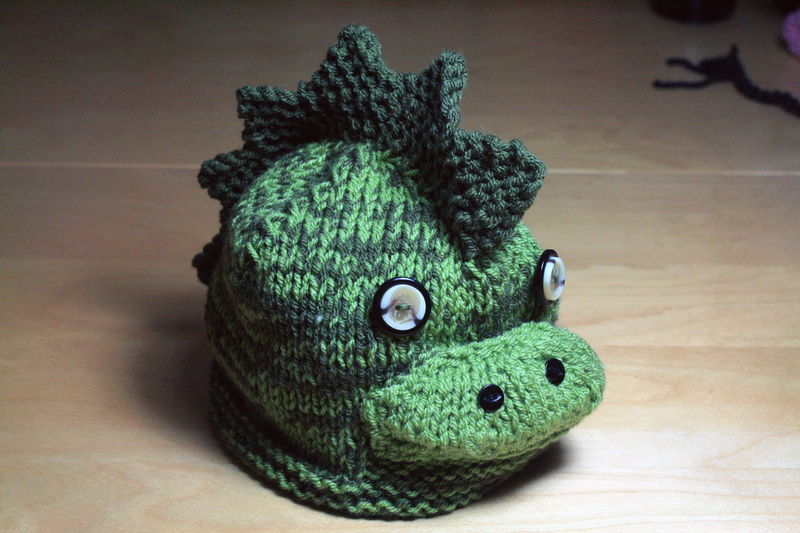 I have made a few hats recently, then my daughter asked me if I could make a dinosaur hat for her partners nephew so I just made it up. Thank you, it was one of those projects that just developed itself.